Another FOTD for you today. I wore this look about a week ago when the Beauty Clique came together for their first gathering. I actually used the Cut the Crease technique but toned it down with neutral colors. 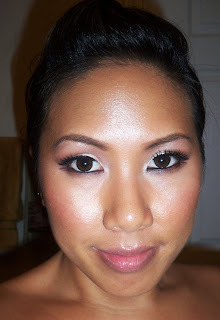 The key to this look is to use an angled brush like the MAC 263. I really like the way it came out. I plan on doing a tutorial on this look soon. very pretty. no wear near as dramatic but pretty effective! This is an excellent look. I will definitely have to try this. I can't wait for the tut. The look is very pretty! Will this work on all types of eyes? you look amazing! i love how soft it is. I like this, can't wait for the tutorial! lovely!!! 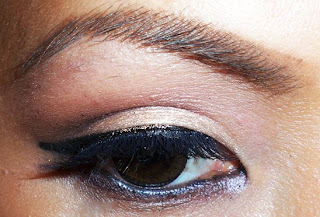 the look & crease looks fab! I've been attempting the crease, but it's difficult! hhaha. You're a pretty lady Ren :) Looking forward to the tutorial! this is so friggin hot!! def make a tutorial! i love it. (semi?) bold neutrals! LOVE this look!! I cant wait for the tutorial!! You look really pretty! I really can't wait to see the video of this look! Jardin Aires is discontinued. What other MAC e/s can we use in it's place? Wow you look glowy, beautiful face and nice eye brows! *_*!